Are you a business owner, leader or executive looking to grow your business, support your team, and create an impact in your community and around the world? Are you worried that you are wasting your time, money, and energy on all of the wrong things? Let’s work together to help you lean in to what is possible! Determine how clearly defined your vision and mission are, and what you can do to improve them. Identify the strengths in what you currently have in place to fully execute your vision and have the impact you know you want to make. Identify the missing pieces in your vision and mission that will hinder your progress, cost you time, money and energy, and prevent you from living your vision fully. Determine clear action steps you can take immediately to improve your vision and mission, and help more people. Upon receipt of the assessment, I will provide you with additional tips and resources to help you live your vision and mission fully. My role is to guide you and help you create the impact you know you are destined to make as you bring your vision to life and live your mission fully. 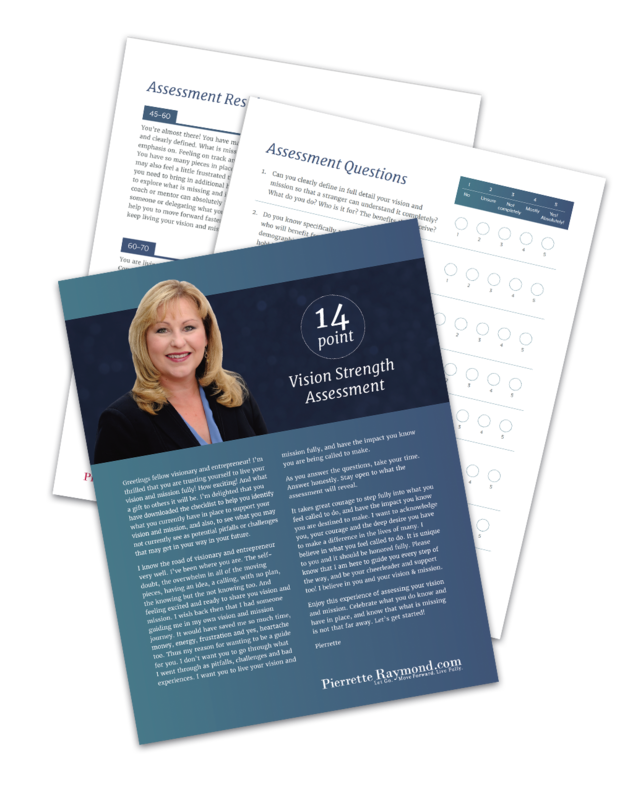 Take the 14 Point Vision Strength Assessment Today! Gain immediate access to the “7 Steps To Create Your Vision & Mission With Impact” webinar, a hands-on and guided workshop to help you gain clarity, focus and ensure you have a solid foundation for your vision and mission. It’s time to uplevel your business and your life!